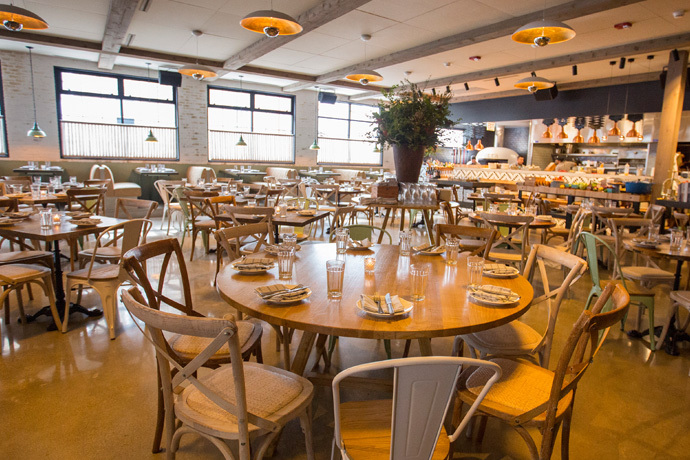 Introducing Tocco, opening tomorrow in Wicker Park. It delivers all the stiletto-honed, thin-pizza instincts of the folks behind Follia (who in a previous life ran a modeling agency) from an address that, amazingly, used to be a Mickey D's. Clad in black mosaics, white porcelain and the occasional lipstick-pink pop of color, Tocco is simultaneously stark and sensual—imagine 2001 as directed by Fellini. Lead your date to a seat at the impossibly long 20-seat glass-top communal table—or better yet, the impossibly long bar—and watch wiry pizzaiolos toil over your Prosciutto e Funghi at dual wood-fired furnaces, while a two-ton wine rack seemingly effervesces above like bubbles in prosecco. Speaking of which, you'll find nickel-plated buckets of the stuff near the cushiony lounge—though don't be surprised if she opts for a Pear Champagne (pear cognac, a splash of Grand Marnier and bubbly). Come spring, the entire east wall will retract, allowing you to eat house-made pasta, Coniglio (rabbit with potatoes) and Scottata con Arugula (pork with fresh arugula) alongside an outdoor performance, which owners hope to host every so often. But right now, you'd settle for just the sunshine. And the prosecco.